30 November 2016, at 12:00a.m. JAPAN - One layer farm and one duck farm have been affected by outbreaks of highly pathogenic avian influenza in Japan. 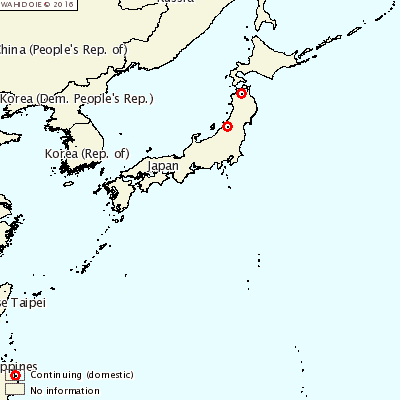 The farms affected were in Aomori and Niigata, and the virus was one of the H5 strains. Destruction of all the susceptible birds in the affected farms is being implemented, which will result in the destruction of over 332,000 birds. That makes these outbreaks the worst in Japan since 2011, according to media reports. Movement restrictions are imposed on the farms within a radius of 3km of the affected farms. Shipment restrictions are imposed on the farms within a radius of 3-10km of the affected farms.